On anyone else, the shirt would have looked gauche. An unimpeachable sartorial rule goes: Thou shalt not wear any article of clothing with thyself's name on it. David Ortiz broke this edict two weeks ago. He is the sort of guy who would have taken a fat chomp off an apple in the Garden of Eden just because, so it wasn't a surprise that he paraded around the Boston Red Sox clubhouse in a T-shirt bearing the phrase that defined Boston during its worst times. "THIS IS OUR F#@KING CITY!" Boston Strong was a rallying cry, an emblem presented in a neat, simple package. What Ortiz said on April 20 to the crowd at Fenway Park – to them, and to Boston, and to a United States shaken by the marathon bombing five days earlier – was something much greater. It was a million thoughts and emotions and feelings distilled to five words. It was the most persuasive reminder yet that life would continue. This wasn't their city. It was their bleeping city. Baseball returns to Boston on Friday. The last time it saw the Red Sox, they were winning the World Series, cementing one of the sport's greatest worst-to-first turnarounds, making even the most hardened cynic at least consider the possibility that destiny and kismet exist. Because as stupid as this may sound, considering they're just a baseball team and all, Boston needed the Red Sox last season, needed them more than usual, which is quite a bit to begin with. Few places adore their ballclubs like Boston does, and in the oeuvre of Red Sox, the list of most venerated now goes like this: Ted Williams, then David Ortiz, a firm second, three World Series rings enough to cement his place over Carl Yastrzemski and Jim Rice and Pedro Martinez and Roger Clemens. They gave Ortiz the microphone that day for a reason: History showed he would perform peerlessly in a vital moment. Of all the people to connect with Boston, the Dominican kid who didn't join the Red Sox until after his 27th birthday and spent most games glued to the bench as a designated hitter was a rather unlikely candidate. 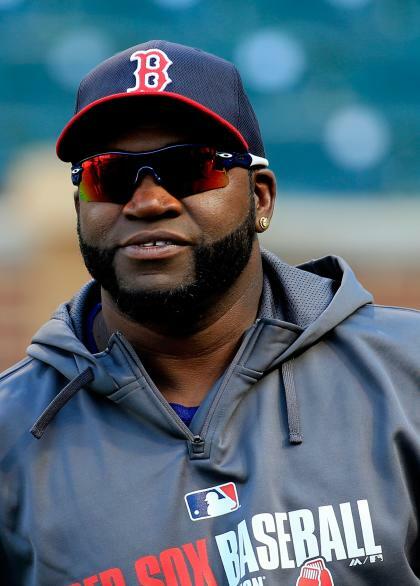 So grand is Ortiz's disposition – the Big Papi character he plays, the diamonds he wears, the sunglasses indoors, the bilingual braggadocio, the home run poses – that they could not resist. Few can. Baseball sells more David Ortiz jerseys than any other. Few, if any, in the league could have created the hullabaloo Ortiz did Tuesday when he snapped a selfie with President Obama during the Red Sox's visit to the White House. 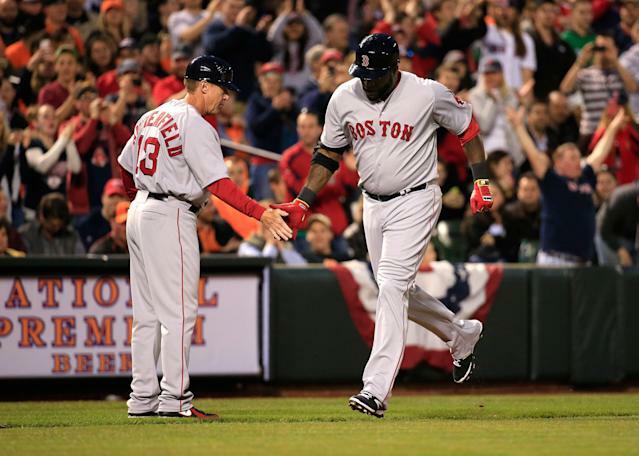 Give this much to Ortiz: In a sport of milquetoast figures, he is the sizzle, and when he strides from the first-base dugout onto the field Friday at 2 p.m. ET, Boston will fete him for what he's done – 373 home runs, 1,191 RBIs and a .292/.390/.572 slash line heading into his 12th season with the Red Sox – and what he plans on doing still. "Boston is a special place," Ortiz said. "It's a baseball town. The fans appreciate what we do. They still talk about Mr. Ted Williams, Yastrzemski, Jim Rice, Pedro. They gave me my career, and it's something I really appreciate." The career will persist at least two more years, maybe more. Ortiz asked for a contract extension beyond this season, the sort of thing reserved for pretty much nobody else his age, and Boston acceded. 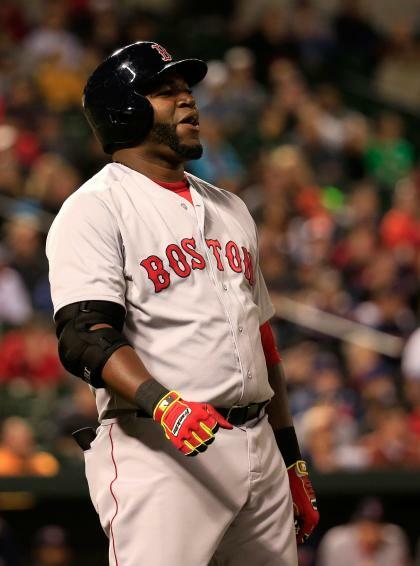 Ortiz, 38, will make $15 million this season, $16 million next season and, depending on his health, production and plate appearances, he remains under Red Sox control for another two seasons at up to $16 million per. "They offered me two options I didn't ask for, and I've got to earn it," Ortiz said. "Which is how it should be. I was surprised, to be honest. I think it was something that showed me a lot. And it was fair. If I'm not ready to play in 2016, I'll tell them straight up. I don't want to be sitting down earning money. If I'm not good to go, I'm not gonna go." An even greater sense of calm than usual washed over Ortiz the day he signed the deal. He leaned back on a chair inside an empty Red Sox clubhouse. The team bus left 45 minutes earlier to go back to their camp in Fort Myers, Fla., and he was about to take his wife and two of his kids to the airport. There was one problem, of course: Every time he goes anywhere, his daughter Jessica joked, "He gets mugged." That included Sarasota, Fla., where the game was rained out, and where people awaited his exit. Three men took it upon themselves to locate Ortiz's car and drive it toward the facility entrance. In the meantime, D'Angelo Ortiz, a precocious 9-year-old, couldn't conceive of Prince Fielder at age 12 hitting home runs in major league stadiums. So he ran it by his dad. "How'd he do that, though?" D'Angelo said. "But, Dad, how?" D'Angelo replied. There was no good retort. D'Angelo, unsatisfied with his dad's effort, said: "This is crazy. What is this world coming to? I'm leaving." And then he scurried over to what was left of his nachos and cheese, some of which had made it on to his shorts in an earlier snack-food faux pas. This was the portrait of an athlete content in who he is, where he is, what he is. He just came off one of the greatest World Series performances in history. He plays for the team he loves and that loves him, the latter of which is especially a big accomplishment, considering how many former Red Sox stars left toward the end of their careers on miserable terms. He reconciled with his wife, Tiffany, after a planned divorce was put on hold. He managed to weather his positive steroid test in 2003 without derailing his career and outlasted a brutal start at the beginning of the 2009 season in which he carried a sub-.200 batting average halfway through June. Boston loves him not just for the World Series in 2004 and '07 and '13 but those weaker moments, too, the ones that humanize him. He fought against a slowing bat somehow and regained the composure to square up fastballs traveling in the mid-90s. The PED pass happens in every hometown, willful ignorance just a symptom of fans' blindness toward a person in a jersey. Ortiz will don that Red Sox uniform Friday against the Milwaukee Brewers, and knowing him, underneath it will be that T-shirt, the one that quotes himself. He'll stand there in that little bandbox, see the people he helped heal last year, know that millions more exist beyond Fenway Park's gates, wear the words that uplifted them during tragedy and go to work. This is his bleeping city. Now and forever.